The 5-day Fine Art Exhibition organized in London, UK was successfully concluded lately. The Exhibition was hosted by the Arab British Chamber of Commerce and on its opening day a significant number of people attended. 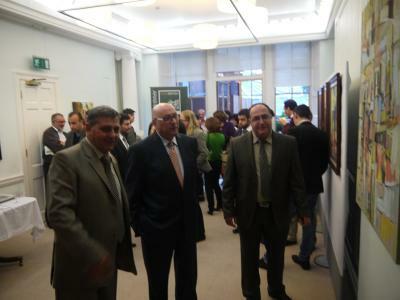 The Exhibition was inaugurated by Professor Manuel Hassassian, Ambassador of Palestine to the UK, and delivered a speech in which he praised the efforts of the An-Najah University’s staff and artists to organize this event which brought to light the Palestinian plastic art and introduced it to people in the UK. He said that the Exhibition represented a chance to familiarize the British people with the potentials of the Palestinians and their creativity. He also emphasized that this event proved that Palestinians have the right to live peacefully and that they really want to communicate with others around the world. Dr. Nihad Khanfar, President of An-Najah Friends Society in the UK, this event represented a medium trough which Palestinians wanted to communicate with others; it is art that conveys the messages of human beings and their feelings and Palestinians have the potentials to do so and the right to live as peacefully as others do. Omar Badour from the Arab British Chamber of Commerce thanked all those who made this event a success and expressed the Chamber of Commerce’s readiness to continue to support such activities and events that enhance the existence of the Palestinian people and their message to the world. Dr. Hasan N’erat, Dean of the Faculty of Fine Arts at An-Najah, delivered a speech in which he thanked Professor Hassassian and An-Najah Friends Society for their support and cooperation and said the University is always ready to organize such exhibitions for its students to give them the chance to showcase their art work to the world. The Exhibition consisted of 57 different paintings made by 34 artists most of whom were An-Najah fine art students, in addition to several statues and other pieces of art work made from copper and ceramics. The showcased art work addressed many themes such as the different aspects and episodes of the Palestinian daily life and reflected many scenes taken from various areas in Palestine such as the countryside and the city, in addition to conveying historical, economical and social messages. The Exhibition attracted extensive media coverage from local press and newspapers in the UK, in addition to the Turkish TV. Two separate TV episodes were held on the ANB and Hiwar Channels that discussed the different aspects of the Exhibition with Dr. N’erat and Mr. Kamal Zaidan, Fine Art Lecturer at An-Najah. This Exhibition was the first of its kind to be held in the UK for the students of An-Najah University and represented a major step for the Faculty of Fine Arts on the international level. The young artists extensively benefited from their participation in this event as they were given the chance to present their art work in front of the world’s leading experts in the field of fine art. Receiving feedback from the experts will definitely have very positive impact on the students and shall help them develop further in their career. As part of the Exhibition, the Faculty of Fine Arts’ delegation which consisted of Mr. Hasan Draidi and Mr. Kamal Zaidan and headed by Dr. N’erat also had several open meetings with British artists and fine art professors during which they discussed the possibility to have some of them visit the Faculty of Fine Arts at An-Najah and learn about its academic and artistic needs. This would also include holding workshops and training courses for the students which would be administered by international professors and artists. Consequently, this would bring benefit upon the students and the Faculty’s staff with respect to expanding their experience and enhancing their artistic skills and potentials. The Department of Plastic Arts with its both divisions (Painting and Ceramic art) participated in an interactive exposition on the occasion of International Women's Day 2018.